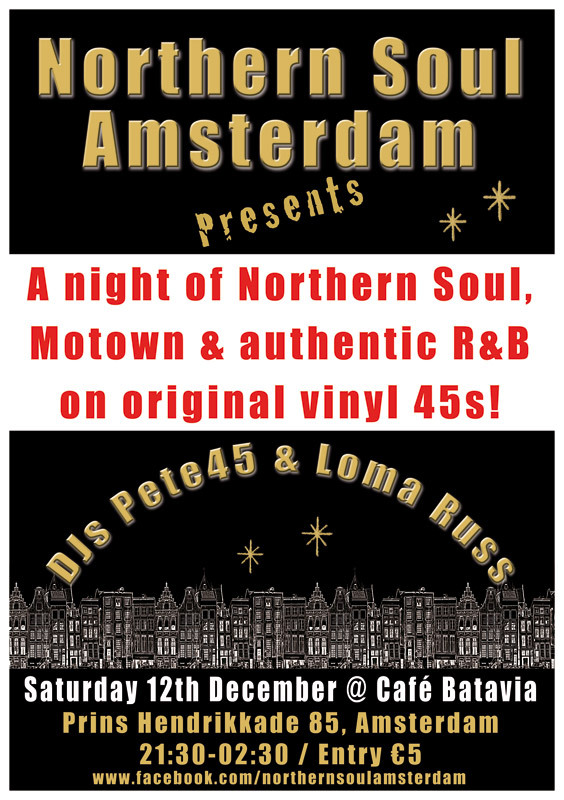 December 2015: launch event with hosts and resident DJs Pete45 & Loma Russ. 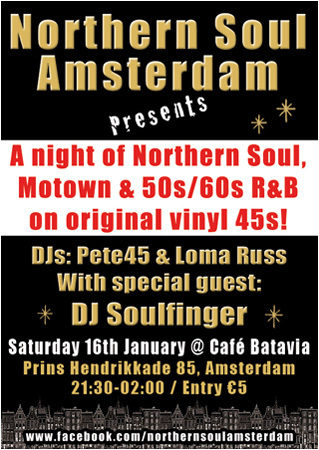 January 2016: guest DJ Soulfinger. 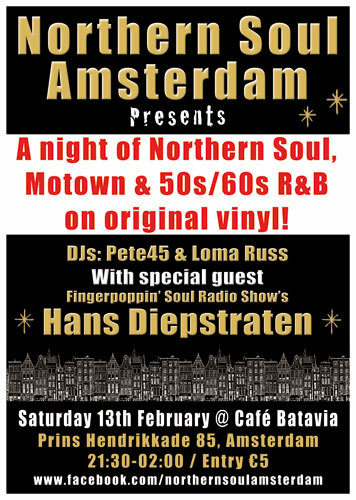 February 2016: guest DJ Hans Diepstraten. 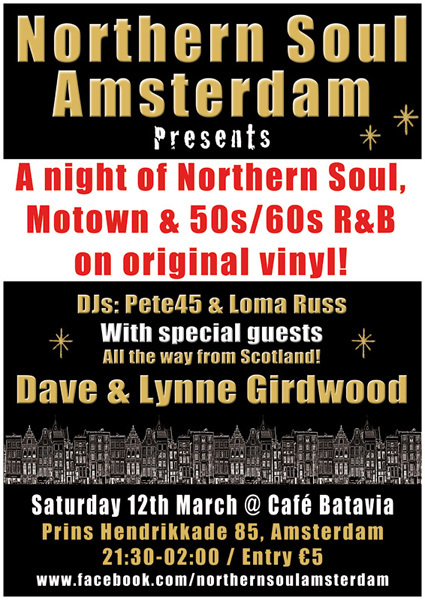 March 2016: guest DJs Dave & Lynne Girdwood. 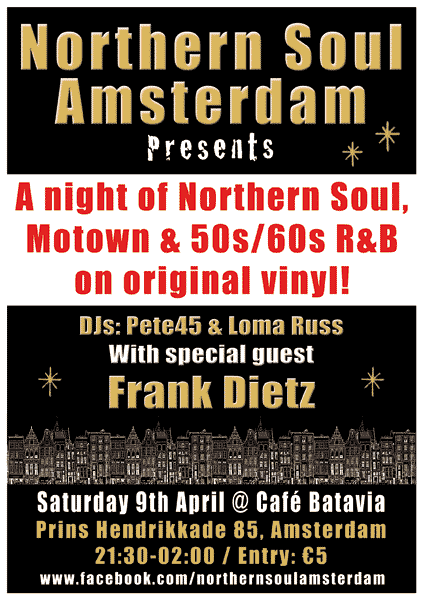 April 2016: guest DJ Frank Dietz. 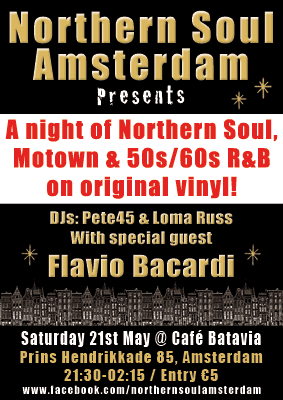 May 2016: guest DJ Flavio Bacardi. 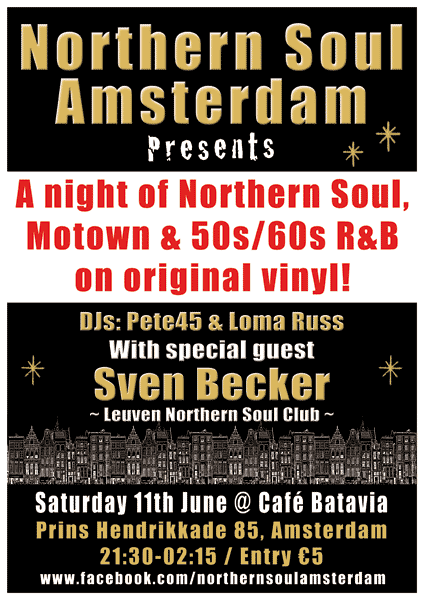 June 2016: guest DJ Sven Becker. 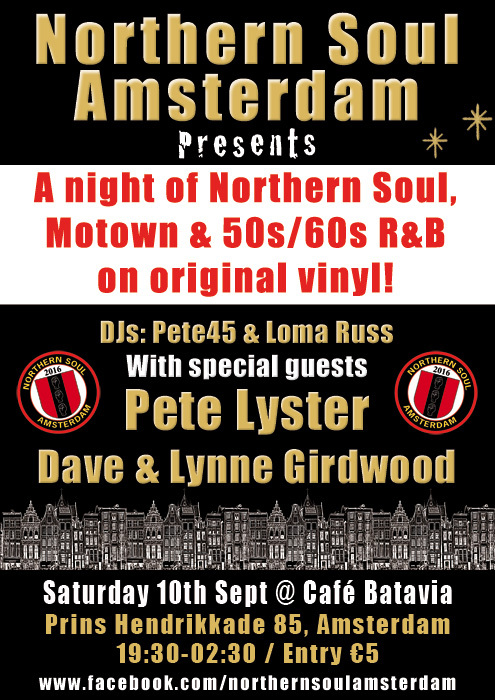 September 2016: guest DJs Pete Lyster and Dave & Lynne Girdwood. 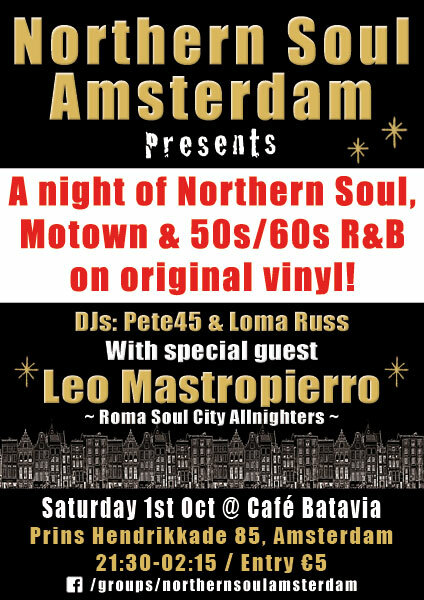 October 2016: guest DJ Leo Mastropierro. 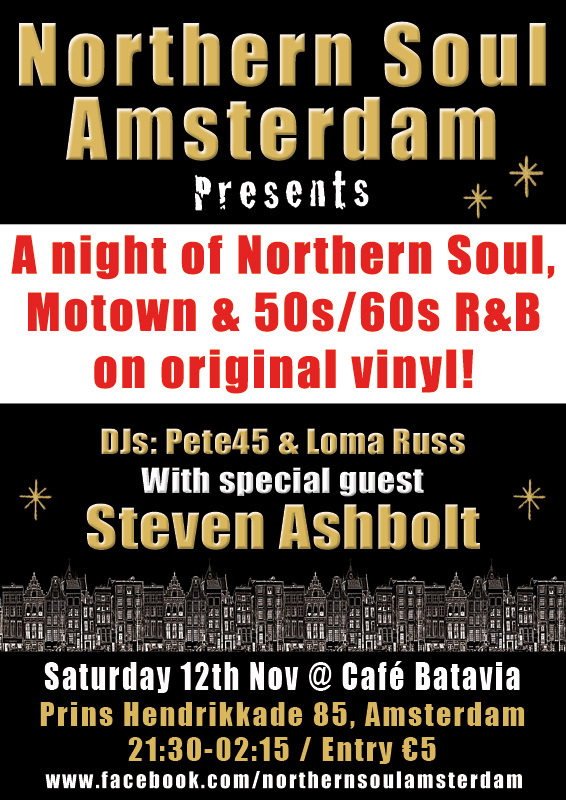 November 2016: guest DJ Steven Ashbolt. 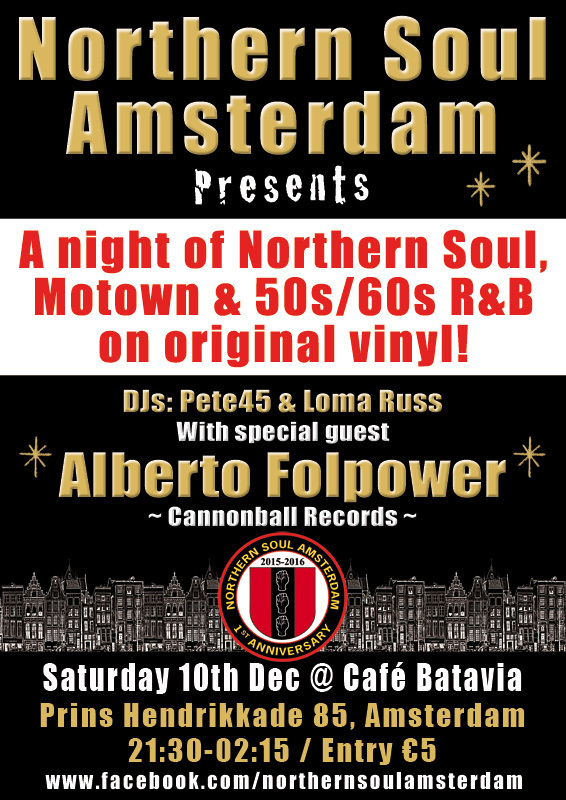 December 2016: Northern Soul Amsterdam's 1st anniversary with guest DJ Alberto Folpower. 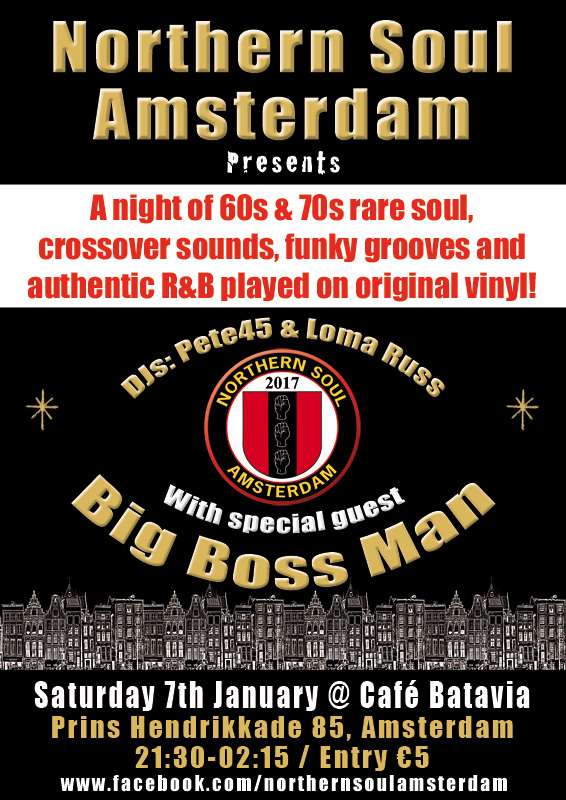 January 2017: guest DJ Big Boss Man. 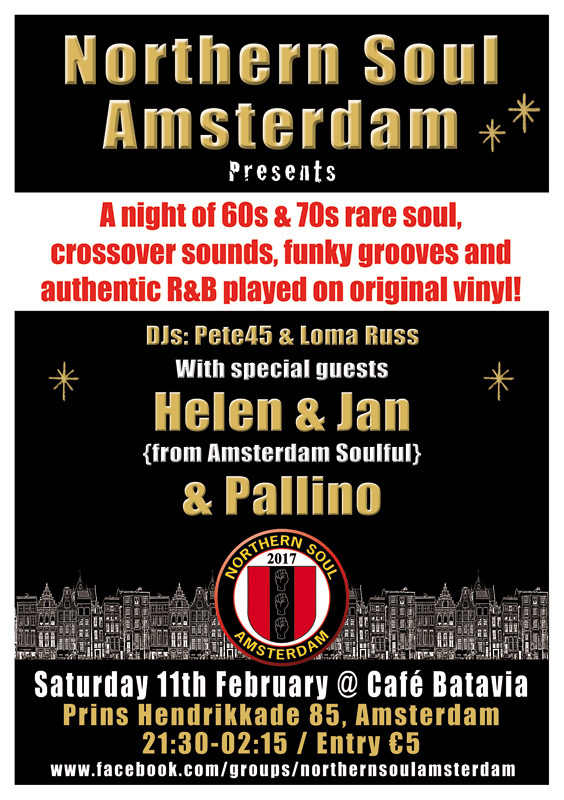 February 2017: guest DJs Helen & Jan and Pallino. 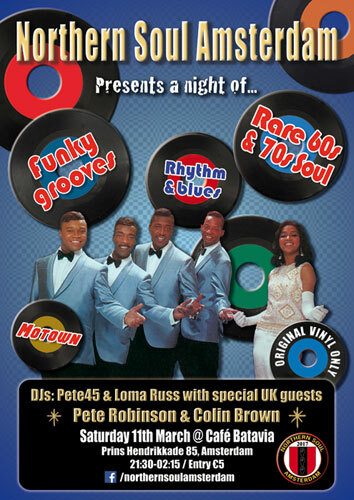 March 2017: guest DJs Pete Robinson & Colin Brown. 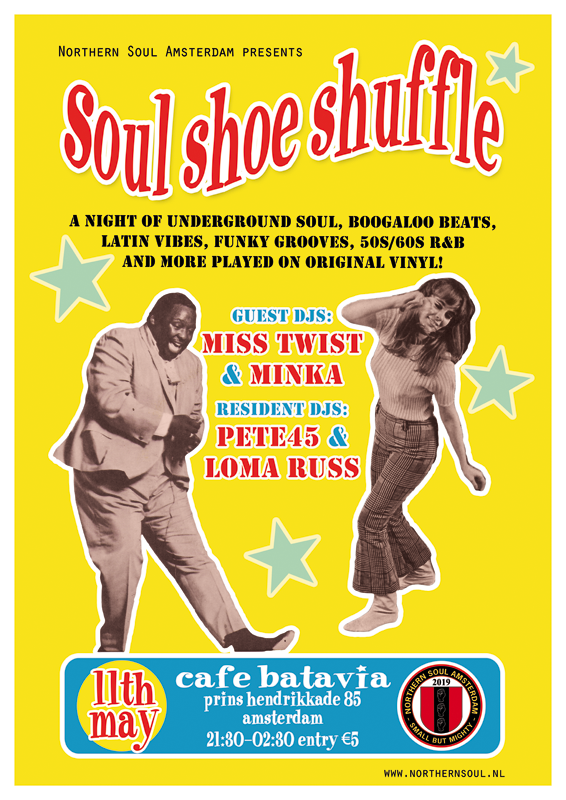 April 2017: with resident DJs Pete45 & Loma Russ. 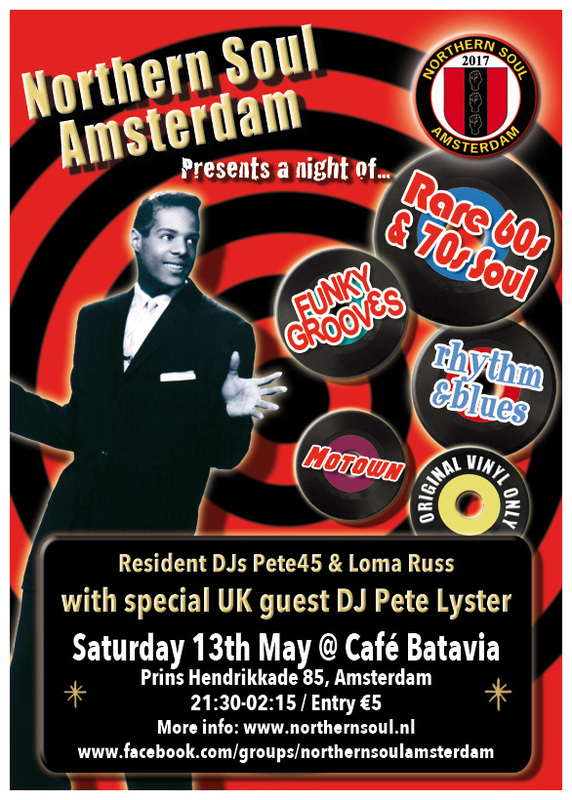 May 2017: guest DJ Pete Lyster. 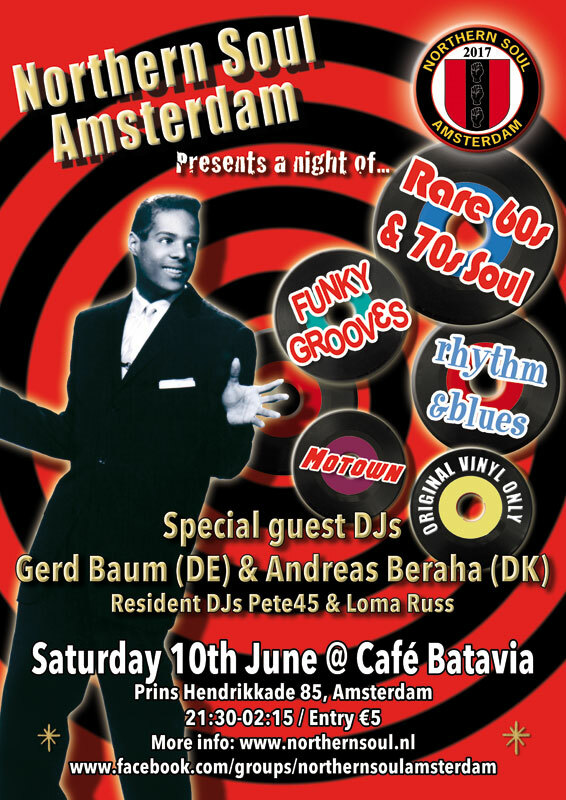 June 2017: guest DJs Gerd Baum & Andreas Beraha. 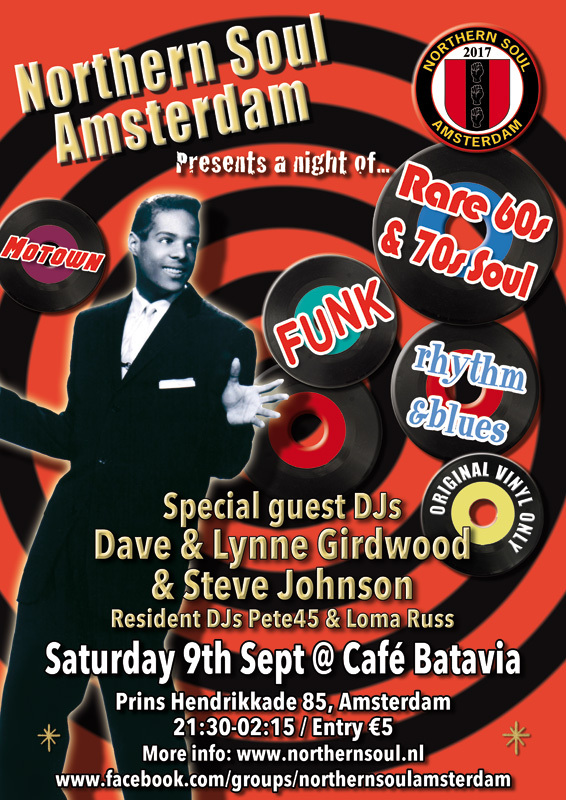 September 2017: guest DJs Dave & Lynne Girdwood and Steve Johnson. 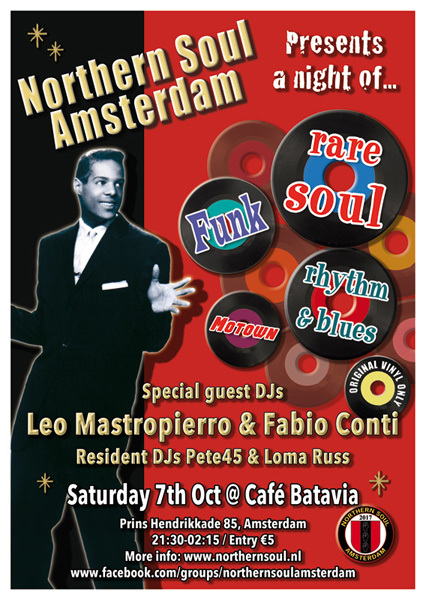 October 2017: guest DJs Leo Mastropierro & Fabio Conti. 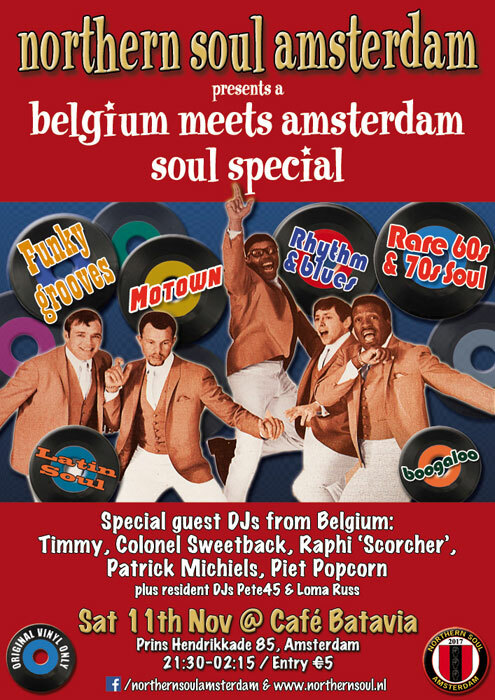 November 2017: Belgium meets Amsterdam soul special. 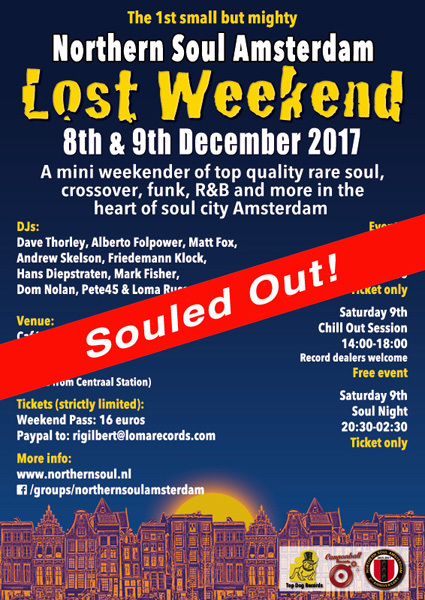 December 2017: the 1st Northern Soul Amsterdam Rare Soul Weekender. 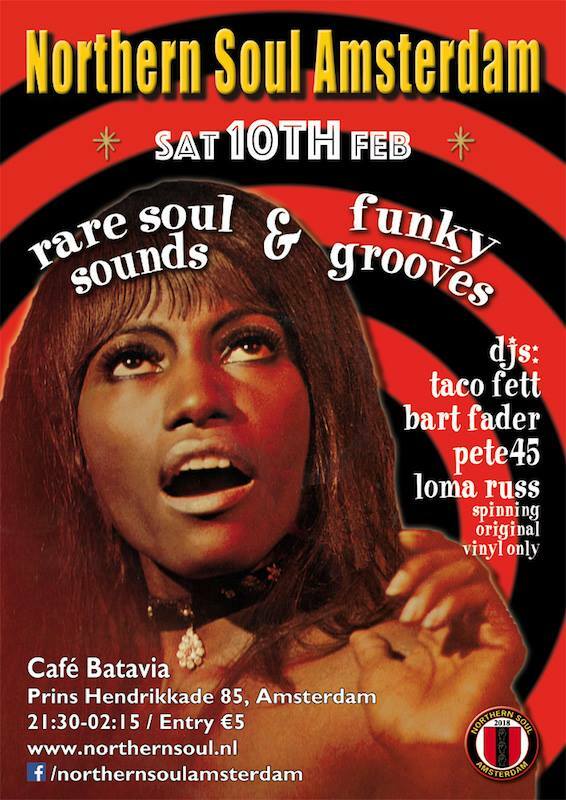 February 2018: guest DJs Taco Fett & Bart Fader. 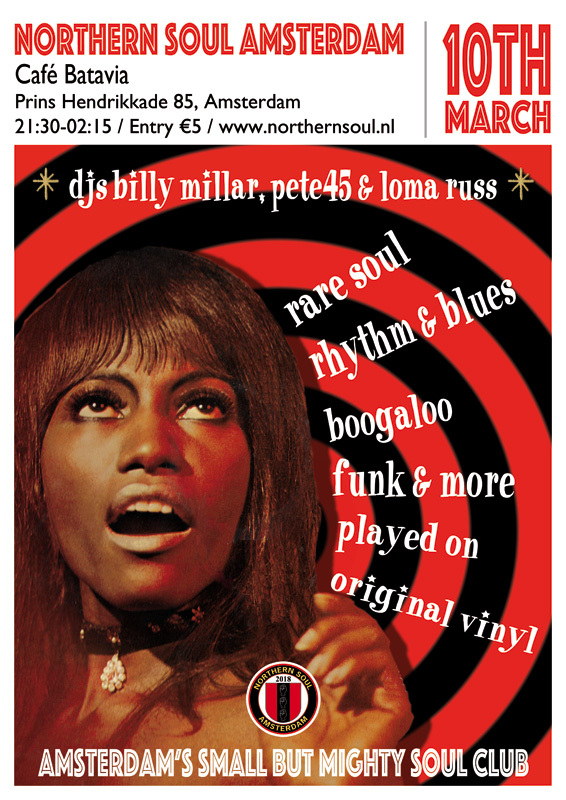 March 2018: guest DJ Billy Millar. 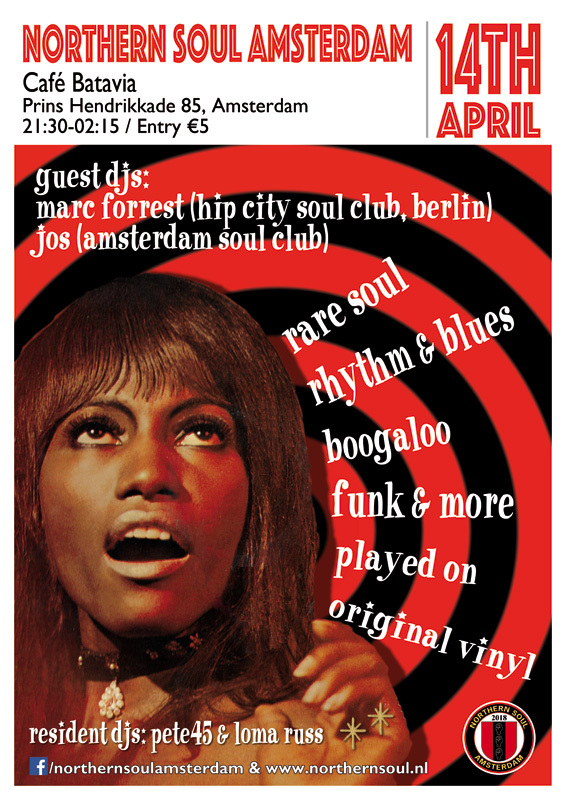 April 2018: guest DJs Marc Forrest & Jos. 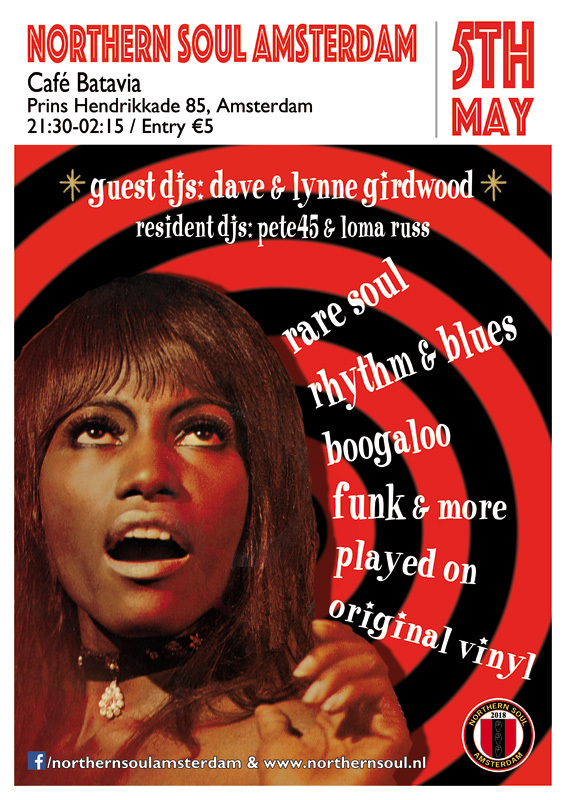 May 2017: guest DJs Dave & Lynne Girdwood. 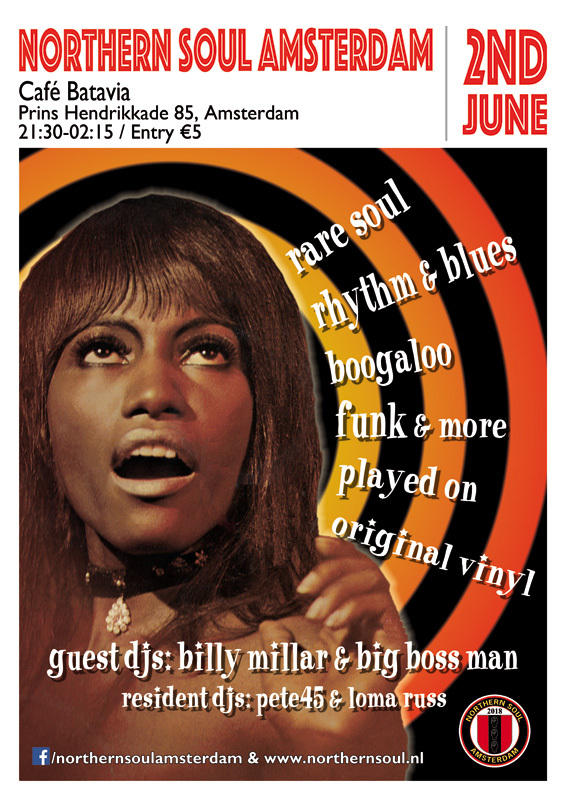 June 2018: guest DJs Billy Millar & Big Boss Man. 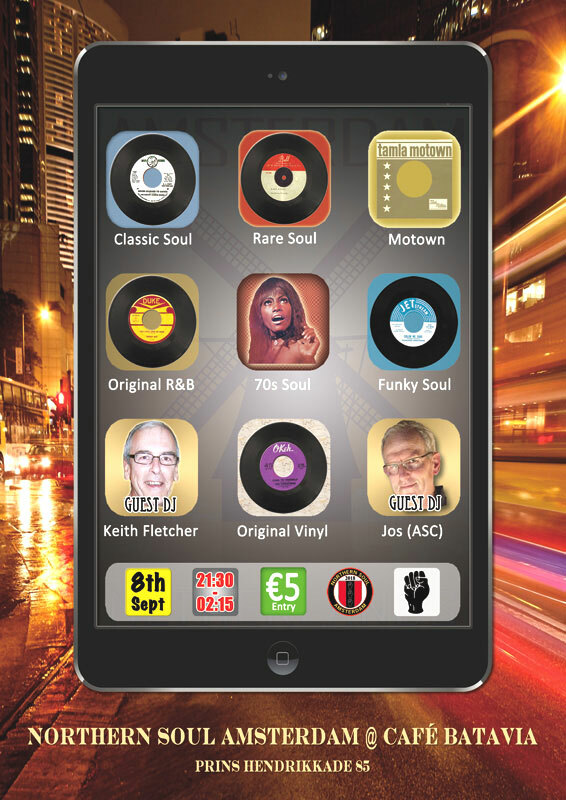 September 2018: guest DJs Keith Fletcher & Jos (Amsterdam Soul Club). 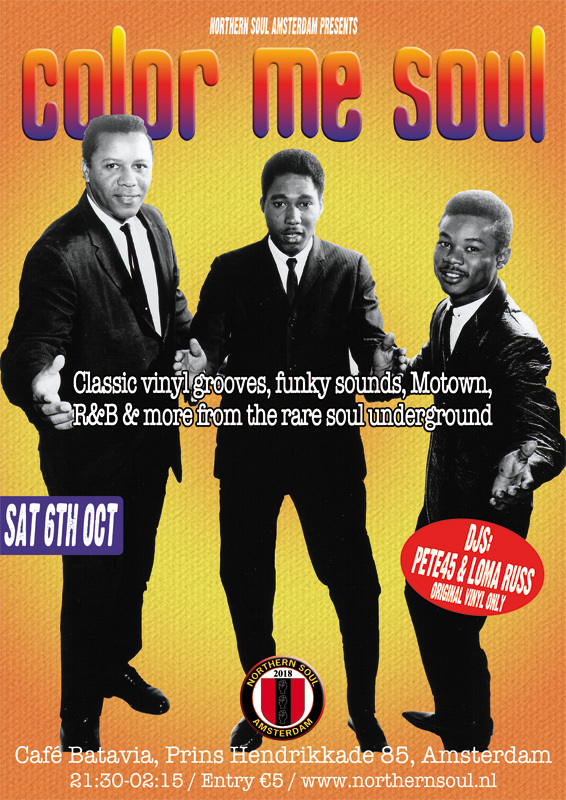 October 2018: with resident DJs Pete45 & Loma Russ. 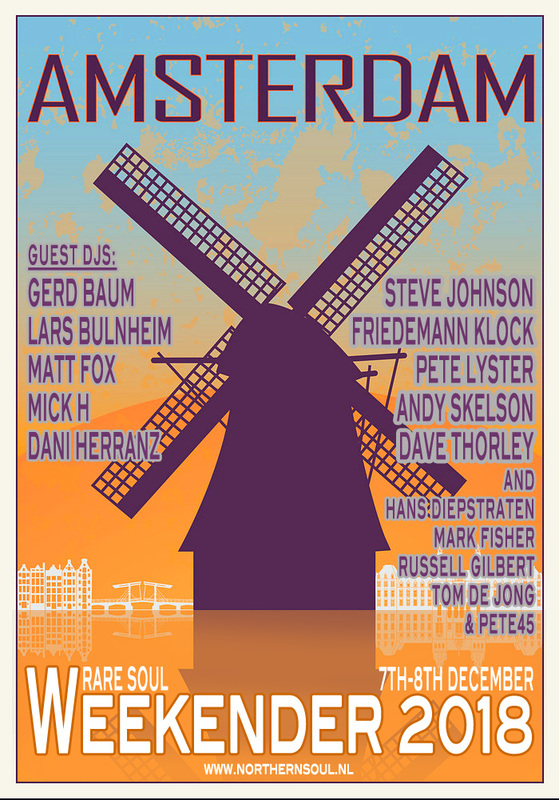 December 2018: the 2nd Amsterdam Rare Soul Weekender. 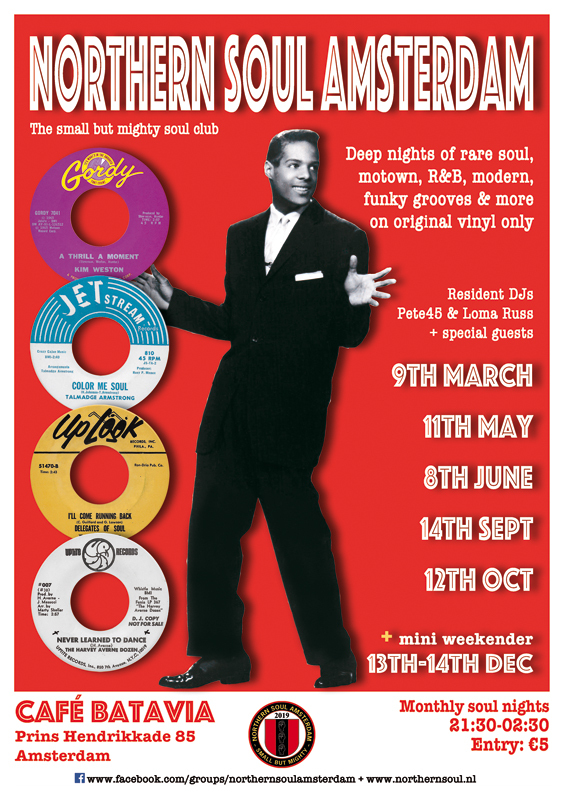 Flyer for Amsterdam soul nights and the Amsterdam Rare Soul Weekender in 2019. 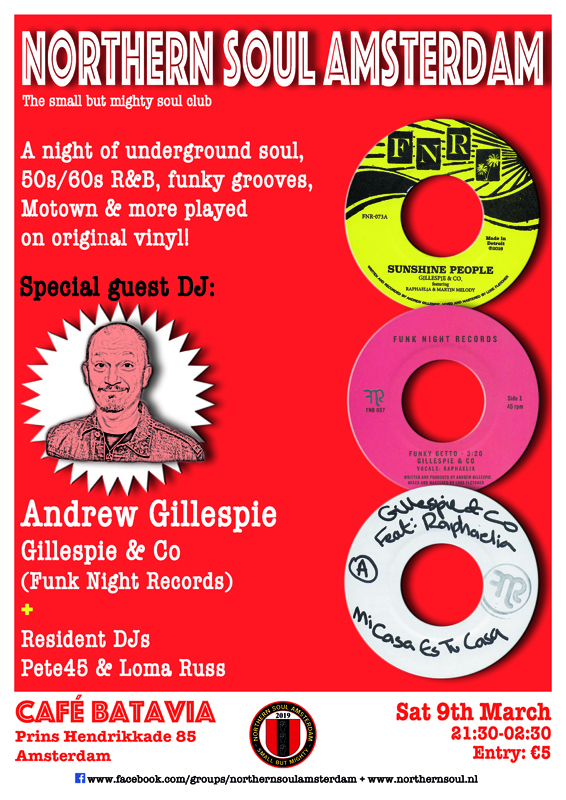 March 2019: guest DJ Andrew Gillespie. 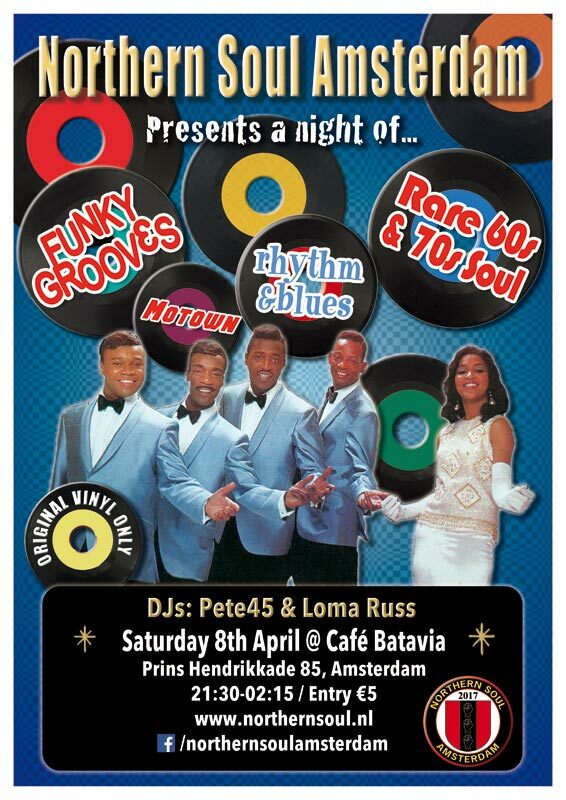 Northern Soul Amsterdam special guests for May 2019 - DJs Miss Twist and Minka. 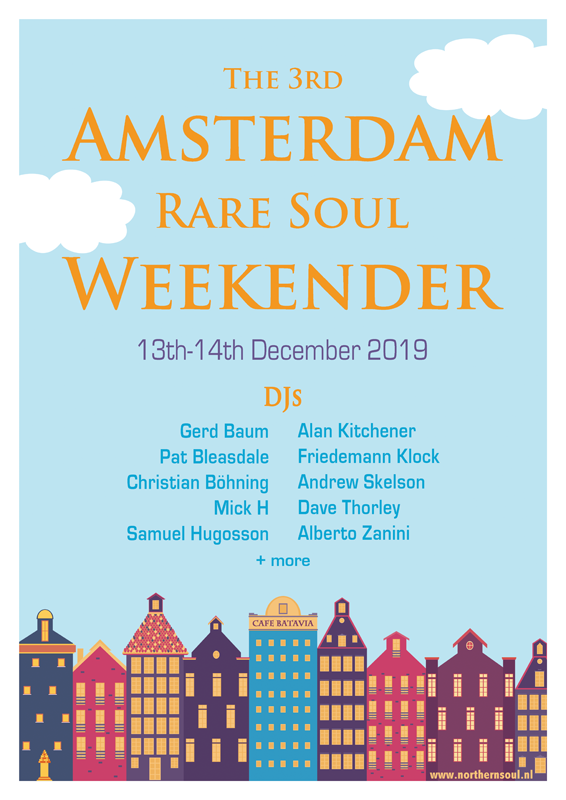 The 3rd Amsterdam Rare Soul Weekender: 13th-14th December 2019. 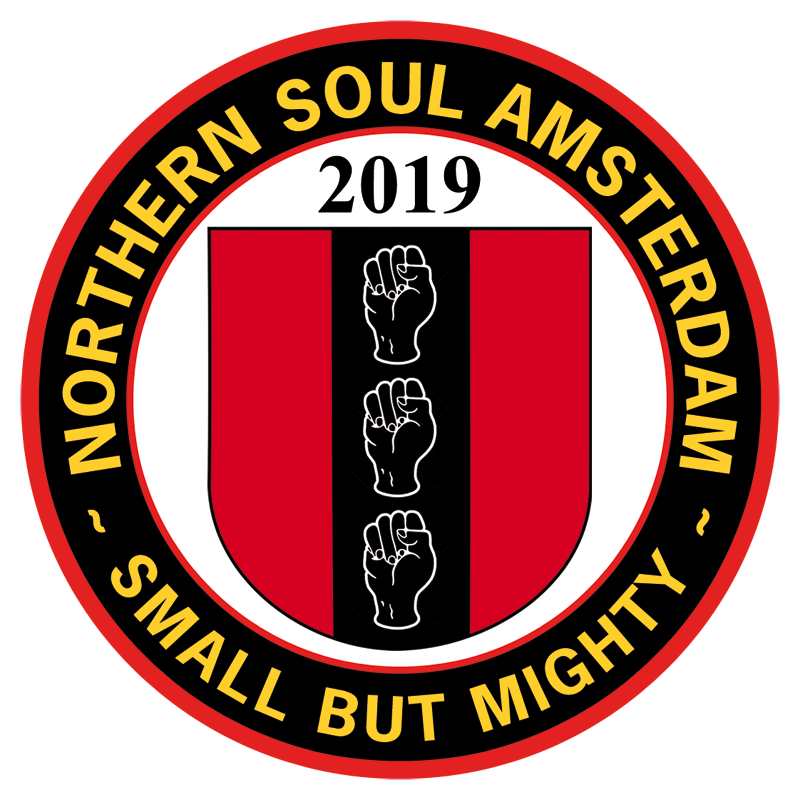 Northern Soul Amsterdam - the small but mighty soul club © 2015-2019. This is a cookie-free website and no user data is gathered.